This entry was posted on October 7, 2018, 11:00 AM and is filed under Fire Department History, Historic Fire Photo. You can follow any responses to this entry through RSS 2.0. Both comments and pings are currently closed. Chris, do you have any other information on the fire at the stables 2153 N Clark, such as what time of day it was? Was the the Still and Box at 2153 Clark earlier in the day or later at night as many of the same companies were due on the Still and Box and the 5-11 on Elston? Those fires were only 2 1/2 miles apart. I don’t know if you remember but two Snorkels (not including any Snorkel Squads) were normally due on Still and Box alarms citywide. A Snorkel Squad was also due on many Still and Box alarms but not all. On those two fires Snorkel Squad 1 was due by the Still and Box. The fire on Clark Street also had to Squad 10. Snorkels 5 and 7 were both due on those fires on the Still and Box. I’m pretty sure that all three were at the 5-11 on Elston. In 1966 Chicago was running with six Snorkel companies and three Snorkel Squads so there were a total of nine Snorkels in service. All three of the Snorkel Squads were due on 2-11 alarms and a third Snorkel company was also due on the 2-11. 2-11 alarms would have a total of six Snorkel equipped fire companies that were normally due. On the 3-11, a 4th Snorkel was due and after beyond that any additional Snorkels would have to be special called. By the 3-11 alarm there would normally only be two Snorkels left to cover the rest of the city since seven of the nine Snorkels would normally be at the 3-11s. Thanks for the corrected address Chris. I could have sworn that the fire was in the 2500 block of north Elston not the 2100 block. I also remember the riding stable. I was there once with a group of people and the horses came out through the rear alley. Then they would ride a half block east and have to cross Lincoln Park West to get to the riding trail in the park. 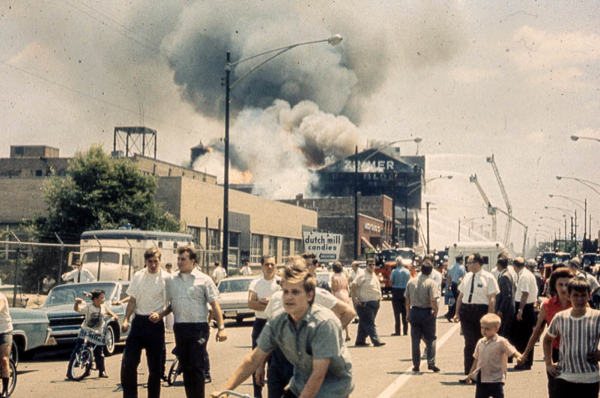 I remember the fire at the Zimmer Box Company very well. In fact I was at the old Riverview amusement park which wasn’t more than about a mile and half north of the fire. It was in the mid afternoon and I was riding on the Sky Ride which was an overhead enclosed tram that went from one end of the park to the other. It was about 2 to 3 stories tall and conveyed on overhead cables. From that car I was able to see the fire and I actually saw some of the Snorkel baskets throwing water. The address listed may be incorrect. I believe it was 2553 Elston which would have been west of Damen and north of Fullerton. I also remember a front page photo in the Chicago Tribune showing Squad 6’s 1949 Mack squad on Elston in front of the fire building. There were firefighters pulling several hoselines that were being connected to the double inlet on the side of the squad to supply the deck gun. They also had two fire boats on the scene as the Chicago River was behind the fire building. The fire boats were Engines 41 and 37. At the time, Engine 41 was located at the Franklin Street bridge on the south side of the Chicago River Engine 41 moved to their station at Throop Street and the southwest branch of the Chicago River in the winter. Engine 37 was at Navy Pier in the summertime and in the winter moved to Franklin Street and the Chicago River. The Zimmer box factory fire? Would love to see some more pics from this one.